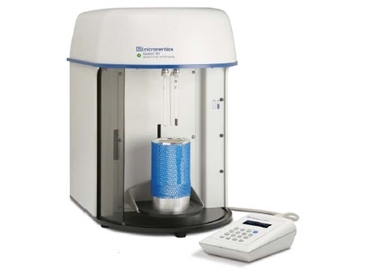 Micromeritics’ Gemini VII 2390 Series of surface area analysers, available from Particle & Surface Sciences produces accurate and repeatable surface area and porosity results. Surface area and porosity are important physical properties that influence the quality and utility of many materials and products. Knowledge of surface area and porosity is key to understanding the formation, structure, and potential application of many natural materials. The Gemini VII 2390 Series of surface area analysers offer advantages such as low cost, speed, simplicity of use, reliability and ruggedness, making them an essential tool in research and quality control environments. Gemini surface area analysers use sample and balance tubes innovatively. These tubes are identical in every aspect including their thermal environment. The sample and reference reservoirs like their associated tubes are physically identical and initially charged to the same pressure. During an analysis, differential pressure between reservoirs is monitored. This common technique confirms that any differential pressure is solely due to adsorption by the sample and not to factors that lead to variations in free space during an analysis. Gemini VII 2390 Series of surface area analysers are available in a choice of three models.